As UWGB embarks on 360° of Learning, Cofrin Library begins 360° of Books! We have a simple question: What’s your favorite book? Our goal is to get 360 UWGB students, faculty, staff, and alumni to tell us their favorites. It could be something from your childhood, your most influential book, or something you’re reading now. We’ll share the results and see which books come out on top! Watch for announcements and post your favorite book on the Cofrin Library Facebook page. 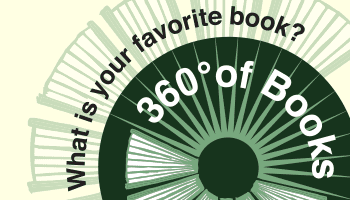 Follow @CofrinLibraryGB for announcements on Twitter and tweet your favorite book with #360booksuwgb. Stop by the library and write it down on our display on the 5th floor. Or use this online form to tell us your favorite.